Raycop is a state of the art hand held vacuum that utilizes the germicidal power of UV-C light to destroy dust mites, bacteria, viruses, E. Coli and H1N1. Raycop eradicates micro-organisms from mattresses, pillows, sofas and other fabrics surfaces. Raycop’s UV-C light deactivates the DNA in dust mites, bacteria, pollen, mold and mildew. Raycop cleans what you can see, and kills what you can’t. Raycop RS2 - 3 modes and rotating brush. HEPA filter, ultraviolet light, weighs 6 lbs. includes stand. Raycop LITE - 1 mode, NO rotating brush, compact size, HEPA filter, ultraviolet light weighs 4 lbs. Both of our Raycop vacuums capture 99.9% of allergens feature dual filtration, including a high efficiency particulate air (HEPA) filter to trap allergens, ultraviolet light technology,pulsating pads, and optimized suction RayClean Technology®. normal and heavy, it also has a rotating brush, and an 11 watt UVC bulb, consumes 300 watts of power and weighs 6 lbs. Raycop RS2 includes a floor stand for easy storage and accessibility. operating mode, 6 watt UVC bulbs, consumes 330 watts of power and weighs 4 lbs. Our Raycop Lite does not have a rotating brush and does not include a stand. The combination of suction and vibration, along with UV light in our patented RayClean Technology® is proven to eliminate 3 times more allergens than a regular vacuum. Even though you don’t realize they are there, dust mites can be found in every corner of your home, including bedding, sofas, chairs, and even curtains. Dust mites leave behind trails of allergenic waste as they move. This waste that they produce gets trapped in your fabrics and is difficult to remove with a regular vacuum. Research has shown that the highest concentration of disease and allergy causing micro-organisms in a home are typically found in mattresses, bedding, sofas, chairs, curtains and carpets. Exposure to dust mites and other allergens in the first 2 years of life can trigger life long allergies, according to several international studies. Approximately 4.8 million children in the U.S. and 150 million people world wide suffer from asthma exacerbated by environmental allergens. With a typical used mattress containing more than 100,000 dust mites, that's 100,000 unnecessary triggers of asthma and allergic conditions in your own home, that can easily be eliminated by the cleaning power of Raycop. Bacteria and viruses, such as influenza (which contributes to approximately 36,000 American deaths per year), easily inbed themselves in contaminated materials. By removing much more than just surface dirt and dust, the Raycop anti bacterial vacuum can safely eliminate these microorganisms from your home environment. 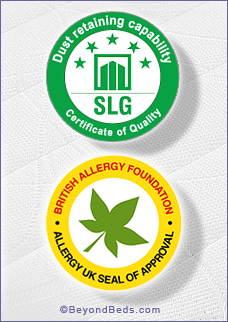 Raycop is the first product of its kind to receive the globally recognized British Allergy Foundation Seal of Approval. The Raycop has a 2 Stage Micro Allergy Filtration system that will safely and effectively help destroy and rid dust mites and allergens. Raycop provides the most complete handheld cleaning system available for allergy and asthma sufferers.